As we near the end of Christmas, I thought I’d share some resources for celebrating Epiphany. 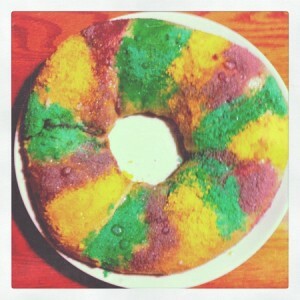 Here’s a recipe I’ve used for king cake. We’re going to a Twelfth Night gathering, so we’ll bring it there, but it would be very appropriate for Epiphany day (the 6th.) It’s transcends the breakfast and dessert line. Different cultures have different traditional king cakes, so if you have a particular cultural heritage or culture you are studying, it could be fun to make their king cake! Beat the eggs in a small bowl and add to milk mixture. Add butter, sugar, nutmeg, cinnamon, lemon zest, and a pinch of salt. Add about 2.5 cups of flour a half cup at a time, mixing with the dough hook on low speed, until it comes together. If the dough is wet (and not just sticky) you can add a little more. Knead by hand on a floured surface for a few additional minutes until the dough is soft and smooth (you may need more flour, add a little at a time.) Place dough in a lightly oiled bowl and cover with a towel or plastic wrap, then allow dough to rise someplace warm for about an hour, or until doubled in size. Mix the filling ingredients together, beating until fluffy. Lay dough out into a rectangle of around 10 x 20 inches (on a lightly floured surface.) One one half (longways, not in squares) spread the cream cheese evenly, then fold the other half over to cover, pinching it together to seal in the cream cheese. Form your bread into a ring. Place on a parchment lined cookie sheet, cover loosely, and let it rise for 45 minutes or so. While it’s rising, preheat your oven to 375. Bake for around 20 minutes, until lightly browned, then let your cake cool. You can add the traditional bean or plastic baby Jesus at this point, by inserting it with a paring knife from underneath. 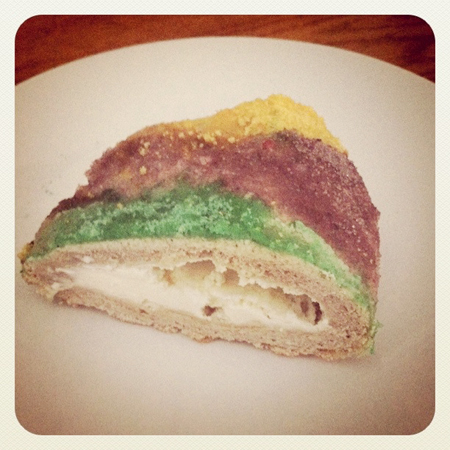 Once I saw a picture of a King Cake (made for Christ the King Sunday, though, not Epiphany) that was a standard circular cake with upside-down pointy ice cream cones on the top to make it look like a crown. Less traditional, yes, but fun! That sounds really cute. I would totally do that for a family cake :) I am not a king cake traditionalist by any means. Thanks for the colored sugar tip. I was going to make one for church Sunday, but didn’t know where I would get those colors — glad to know I can make it myself!